Ideas on how to develop the plans for your new home project. Can you draw your own up or should we help you? How do I know plans are good for permits? Will they be usable to build my new home? What if I want to customize a standard or online plan? Working with building departments. Do I need an Architect to design and build my own home? Fitting your new home on your lot. How does a Structural Engineer help. Interviewer: Hey everybody. 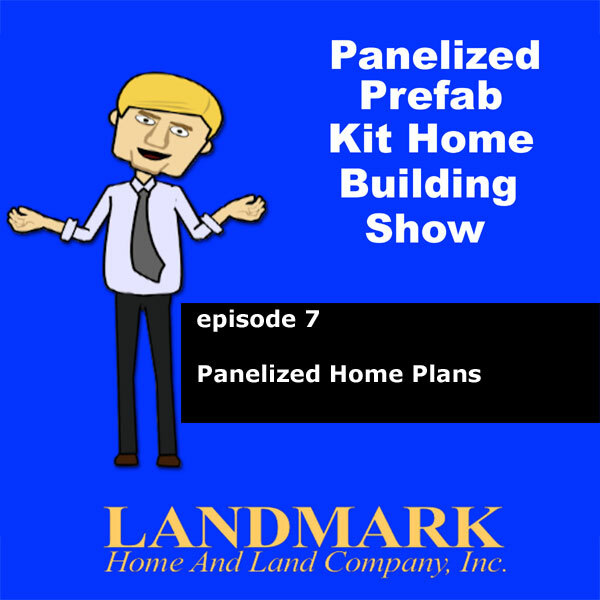 Welcome to the Landmark Home and Land Company’s Panelized Prefab Kit Home Building show. With me as always is the President and Founder of the Landmark Home and Land Company Steve Tuma. Steve, how are you doing today my friend? Steve Landmark: Yeah, it’s an excellent day. I think we’ve got some interesting questions. What do we figure out? We’re going to talk about the most interesting questions that people have asked or common questions. Interviewer: Yeah, that’s what I thought we would get into today. A lot of customers, potential customers write in, looking to know what Landmark is all about and how they can help them with their new home building process. So I thought I would just start and go through some of the questions you guys have gotten lately regarding home building and panelized homes. Steve Landmark: Well, this is an interesting thing. A lot of people ask around the country because not everyone understands that plans aren’t just showing them walls or windows. There’s a lot of details in there to show how the home is to get built or what the house is going to look like or what materials are. So yes, you can draw your own plans. You can get the ideas together. Let us know what you want. But in general, most people don’t have the full knowledge to do a full architectural set of plans. So what we suggest is if you want to draw your own plans, maybe start with the concepts. Say, “Hey, I need a 1500-square-foot ranch with a two-car garage.” If you want to sketch it out or go online to one of the websites where you can do drafting, you could do things like that or maybe you can just draw it up and send it to us in a text, a fax or an email. Then we can review those ideas. But generally at some point, we would probably have to go and expand on your ideas, to make sure that room sizes are right, doorway openings are right, code issues are taken care of. You know, egress on windows, foundations are drawn in and all the technical side. So it’s definitely easy to work off the plans that you have and then go through to finalize them in a format so that they can be used to get permits. What’s interesting is around the country, there are still some building departments that don’t even review plans or you can sketch them on a napkin and turn them in and they will give you a permit. Then there’s also Steven building departments where you have to cross every “T,” dot every “I,” have every single detail to the nth degree. So sometimes people say, “Well, I will actually just be able to turn these in for permits.” Well, maybe you can and maybe you can’t and you don’t know what the follow-up situation is. So it’s not just the concept of drawing the plans up. It’s making sure that the plans are good for homeowners’ associations if one is there for your permits. They also need to be used as a communication method with your financing source, your bank, your contractor, your subcontractors, yourself to know what’s getting built in us, so that it’s very clear what’s there. So you’ve got to have an accurate set of plans and that’s how we’re able to work with you to take your concept and then detail it so that it’s usable for your particular building department. Also your building site and then also how you’re going to build, if you’re going to contract it yourself using subcontractors or the contractor to get it built or even be involved completely with yourself, friends and family to build own homes. So we’re able to work with it. What’s really interesting about this is we’re now able to get in 3D renderings or the colored photo realistic renderings. Steve Landmark: Different details, so someone could really get into the process. So that’s where we can help is the technical understand and the details necessary, so that you can completely envision your project and that’s something that people generally don’t have their own knowledge. So they need someone like us to go through and make sure that it’s done properly and not just that. Once it’s done, the building department may have questions. If someone is drawing their own hand-sketched plans up and they say, “Hey, how are you building the foundation properly?” chances are they don’t have the knowledge where we do. We’re ready to go. We have the answers. We will provide them on the plan and make it easy for them to move forward. Interviewer: Yeah. I have a follow-up question of my own for that. If someone decides after they’ve put their first initial plans together, if they want to change their plans in any way, is that even doable? Well, that’s exactly the situation where we can help. We’ve got on computer systems. So once they kind of figure out hey, they might need a bigger garage, we can go through and change it or if there’s someone that has a view, we can go through and add bigger windows or decks or patios or whatever they would need to do it. The idea is to say, “Hey, Mr. and Mrs. Smith. What do you want in your house? Let’s put it together.” Spend a little bit of time designing it, doing some changes, so you’re completely happy with the design. It’s very easy to change it on paper. It’s also less expensive. It’s quicker. It’s faster and it’s a smarter way to go. So changes are an important part of the evolution of the process, to make sure that you’re spending your money properly and getting the house you want and also making sure it fits on the land. That’s a key point. Interviewer: There’s a question from a lady here. She says, “If I work with Landmark, can you guys help me deal with my local building department?” That seems like a pretty important question. How involved does Landmark get in that sort of situation? Steve Landmark: Well, that’s the key element of what we do. A lot of people have like a standard plan and they’re of the opinion that this set of plans is good for any building department. Well, it may be in one place and it may not be in the other. Every building department is different. Some, as I mentioned, will just say, “Hey, sketch something on a napkin and turn it in.” In some places, there aren’t even building departments. It’s kind of odd to think that but that’s the case. Then other building departments will literally have a list of 500, 600, 700 items that need to be on the plans. These aren’t simple thing like, hey, put a window and put a door knob. They want to know that your handrail is strong enough to hold a 200-pound person. They want to know that the nutrition in the soil is good enough for the landscape design that you have and some of those are pretty in-depth. This is the key of what we do is we make sure that the plans are good for what you want. But it also fits on the land. It also works with the building department. They also have the proper information to go build the home and we do that literally by getting the information from your building department and then going through that list of items and making sure that they’re there. What’s interesting is they’re not all the same. So you can go do a project in Wisconsin and they will go through and say, “Hey, we need these 50 items.” General, you know, elevations, floor plans, foundation details, roof load. You know, maybe a roof design, maybe a plumbing, electric layout and further other details. You take that exact same home to Newport Beach, California, the list goes on and on and on and on. So that’s where we’re able to help is we can go through and justify the details, the structural details, energy code, any green code, any architectural details, any plumbing details, any electrical details, heating and air conditioning details and that’s the key element to it. You don’t have to be the genius to be able to figure out what pipe size you need to go to your – for the gas pipe to your house. You don’t have to necessarily be the person to interpret a grading and drainage plan and see if your car garage door is in the right location. Those are things that we can help with and as building departments get more and more sophisticated, as codes get tighter and tighter, you kind of need someone that is very experienced in these situations. Since we’ve worked all over the country and then some international projects, we’ve got a broad-based knowledge to help someone go through. So we can help you – in the concept, everyone says, “Hey, how do you get me from A to Z?” Well, we will get you from A to Z. But we will fill in the B, C, D, E, you know, all the way through the process to go through. So you don’t have to totally understand an electrical layout. You just need to know that it’s there. The information is there. So you can go get the house properly wired or insulated or cooled or roofing system on. So that’s how we’re able to help and that is a key element because it can get very complex. Interviewer: OK. So that brings up another question. We’ve talked about building departments. How extensive does Landmark get helping with plans for let’s say homeowners’ associations or architectural review boards? Can you run us through that? Steve Landmark: It’s a very similar situation. We will develop the plans and send them to you, so you could submit to either the building department or the homeowner’s association. But the homeowner’s association generally keeps the neighborhood to a certain standard. They’re not checking for codes and safety issues. They’re more checking to make sure the house is of a certain look, a certain quality, a certain size, certain colors, whatever it may be. So some of them are very simple. Some of them will say, “Hey, you need to have a 1200-square-foot home plus a two-car garage.” Others will get detailed where they need to know the types of materials, the looks, the textures, the architectural background and they want to know everything about the exterior look and the size of the home, certain calculations, calculations of how much space the house takes on the land, how much space the sidewalks, the driveways take and different details, different colors, different details that need to be put on the plans. So yes, we’re able to do something. We’ve worked with some extremely tough ones and just like tough building departments, you get the details, what they need. We supply the information. We help you get – gather it and get it and we put it on the plans. So then it’s clear. You always want the homeowner’s association approval before you submit for permits. So a lot of building departments will request that that’s approved before you submit to them. So they’re not approving a home later to find out that the homeowner’s association won’t approve it. But again, that depends on how stringent they are in their guidelines. But yes, homeowners’ associations, architectural review boards, we’re completely capable and set-up to develop the plants to the details that they need, so that they can approve – review and approve the plans. It’s a relatively simple process for us. Interviewer: Well, that’s good. So you guys are pretty involved all the way around, helping to build it. That’s pretty amazing. Here’s a gentleman that says he has friends who are currently working with architects. Steve Landmark: You don’t need an architect as such. What you need is the proper set of plans. So a lot of people go through and work – they think they need to work with a local architect because they’ve been told that by someone. But there’s no requirement that you need an architect and what people sometimes find is they go through and develop a set of plans. They go in and say, “Hey, I want to have a house of a certain price range,” and then the plans get to be bigger or they’re out of the budget or sometimes they have structural issues. So, no, you don’t need an architect. We actually work as the combination of the architect, the structural engineer, mechanical people and energy codes and supplying the panelized home package. So through one contact, you’re able to take care of all those disciplines to make sure that it’s put together and we will work with you on the changes, revisions. Not just on the revisions for architectural but also make sure that they follow through the complete plan set. So for example, Steve, let’s just say you were doing a set of plans and you moved a wall and that wall happened to have an electric socket in it. Well, obviously your electrical plan then needs to change. It could change your foundation plan. It could make a variety of different revisions or create the need for a variety of different revisions. So the architect is not required. Why people find us to be of value is we act as the architect. We do all the architectural work. Wrap it into one cost with one contact, so it’s easier for you to design, manage and understand your project and also your budget. It will save you a considerable amount of money with the process that we have. I think that’s the reason why people like us is we can go through and wear multiple hats and take care of the issue and control that design cost. When you look at the design cost and now the building cost, that’s where we really, really excel. Steve Landmark: That’s an interesting one and not a lot of people realize this. Some building departments, like I said, are simple. You go in there. You give them a set of plans. You can walk out with a permit. Others need a day or two to review. Others do an in-depth, thorough review of everything. That is part of our process and it’s not an additional cost to respond to those for the building permit, to go through to make sure that it’s there. So if they ask a question and say, “Hey, can you verify that the bedroom windows are egress?” we will show that the dimensions that are already on the plans do match egress or, you know, maybe they’ve got questions about HVAC or an electric circuit or roof loading or this or this or that. We can go through and do it, so you don’t – you as the customer don’t suddenly have to be an electrical engineer, an HVAC engineer, a foundation engineer, a structural engineer. You can just send it to us and we take care of the issues. Now the actual application, we mail the plans to our customers because the building department requires that a homeowner or landowner supplies – that they need a bunch of information and probably pay some fees. So we will mail the plan set, the complete plan set or however many sets of plans they need to the customer. Some building departments need two. Some need seven. We will send a complete plan set, so they can take it and walk right in and apply for their permits. Interviewer: Here’s a guy who wants to know, “How do I know my plans are designed properly to match the complete plan set to the panelized home package?” Can you tackle that one for us? I’m sure there are differences within milk but generally are considered to be the same. But in plans, just because it looks good – you know, you’ve got windows and doors and different things. That doesn’t mean it matches the structural plan. That doesn’t mean it matches the energy requirements. We’ve seen this many, many times in people. This is a very common problem, no matter if you got them from the local kid in high school that drew your plans or someone that won – has won a lot of awards in your neighborhood. It’s that we’ve seen things where they need a certain level of insulation in the wall and there’s no space for the insulation or that happens a lot in roof systems. So we’ve seen situations where people have designed certain sized beams that are bigger than the floor system that they’re supposed to fit in and they create different architectural issues. So these are things that it’s important to make sure that the architectural plans match your structural plans, match the energy codes, match any green code considerations, to make sure that the panelized package is built right. That makes it easier for permitting. It makes it easier for actual building because you’re not solving problems in the field. You’re solving them on paper. We’re solving them for you as part of our service and it also helps you control your budget because if you go through – you know, the insulation is one of the prime things. If you go through and it says you need to have R-48 insulation in your roof and there isn’t space for R-48 insulation in your roof and you find that out when your house is framed. Interviewer: You got a problem. Steve Landmark: It creates a little kind of like, “Uh-oh!” You know, scratch your head for a while. So that’s why we think it’s important to have an understanding of a unified plan set because you don’t want to end up stuck in the corner through the building thing. It’s going to end up costing you money and it’s going to be a hassle. It’s going to be a delay. It’s just one of these situations that you want to avoid. That’s the key element as to why we say, “Hey, work with us on the plans,” because we can make sure those elements are taken care of properly. We can make sure it’s put together. One of the common ones is someone came through to us and said, “Steve, I got this great plumbing plan from this standard plan company and they were just so great.” So they plumb the house and then later, they found out their water supply was on the other side of the house. So they had to rerun it. Very simple situation to avoid. Very simple. But in that case, it took an extra day or two of plumbing and an extra cost to reroute plumbing. Interviewer: It’s an expensive little problem that could have been fixed early on. Steve Landmark: Right. So it’s what I call do your homework upfront. Steve Landmark: You know, make sure you know what you’re doing. Think it through. You know, sometimes little things come up here and there. But the reality is, is you want to go through, make the process happen. Have a good design, so you don’t end up with changed orders. You don’t end up with delays. You don’t end up with budget problems. That’s the way to keep it on track. Do the thinking upfront and that’s what we work with you, to make sure it’s good for what you need, your building department, your contractor, homeowner’s association and we take it from there. We do also support our projects all the way through. So let’s just say you end up with a situation where you need to do a change and the house is half-built. We will still hang in there with you and figure out what needs to be done to go through it. Somewhere someone said panelized homes can’t be changed. I’m not quite sure where they get that idea. But we’re fully capable of making revisions. We want to avoid it. But if someone had to have some change for some reason, we will gladly help our customers through the process. Interviewer: Right. Here’s the simplest question we’ve got. But I will bet you, it’s one of the most important. How do I know my home design will even fit on the lot I purchased? Steve Landmark: That’s an interesting one because we’ve actually – that can become complicated. You end up in situations where people say, “Hey, I got a 50-foot wide lot. But then I got this beautiful set of plans for a house that’s 60-feet wide. Well, that’s a pretty obvious situation. But I think where that question is really going is sometimes there are zoning issues. Sometimes there are setback issues and sometimes those setback issues are a little more complicated than they appear to be because we’ve seen situations, you know, more on the East Coast where people say, “Hey, I could have a 10-foot setback on each side, 20 on the front, 20 on the back,” and then you find out they’re in a historic district. Well, back in 1770, they didn’t exactly have zoning and all of these things. So – and then maybe lots change or people cut land off to give to a relative or whatever. So the key to that is the understanding of how to interpret these things in the setback and also where the setback goes. We have had situations. Let’s just say Steve a 50-foot lot, a city lot, five-foot setbacks on each side. For 10 feet of setback, there’s 40 feet. Some building departments take – allow that 40 feet to go to the edge of the wall of the house. Others want it to go to the overhang and still others are a little more specific, want it to go to the edge of the gutter. Steve Landmark: OK. If you don’t know that, you can say, “Hey, I’m going to put my 40-foot wide house here,” and then find out that no, you got to redesign the house because you have a foot over hanging four feet of gutters. You’re 28 inches to – now it sounds goofy and it kind of is. It doesn’t happen a lot but it’s better to check that out before you’ve designed and done it. So it’s easier to go through and get that put together and there’s a lot of situations, especially for our customers in the West. We’ve all heard about the fires. A lot of these setbacks aren’t just there to keep you from – you know, your homes to be too close. It’s make sure firemen can get around or easements for utilities and stuff like that. So sometimes there’s conflicting situations where your building department wants this. But your fire department wants that and you’ve got to interpret it on how it goes. In a lot of places, there are height restrictions. You know, a lot of the mountain areas, they don’t want you building a house to block your neighbor or to look like a sore thumb in the community. So there’s – it’s not just how will it fit within the footprint, but how will it fit the driveway, the sidewalk, fireman’s access and also height restrictions and how those height restrictions are calculated. Steve Landmark: So there’s a lot of interesting ways that building departments can come into, to determine if your house is a certain height. Some take the average of the four corners. Some take the average of a high and a low. Some take the average of the undisturbed soil. Some take the average of the proposed soil. So there’s a lot of stuff. Now it’s not a big deal for us to work with it. I wouldn’t get hung up on it. I just want to tell people that it’s something to look at. It can affect the design of your home and we’re here to help you walk through that process. Interviewer: Here’s a question from someone. Dear Landmark, I hear a lot about structural engineering. What is a structural engineer and do I need one? Steve Landmark: A structural engineer is someone – you know, in simple terms, make sure your house stands up and not just stands up by itself. But if you’re in an earthquake area, make sure it can withstand the shaking of the earthquake and if you’re in the high snow load area, make sure that it can support the roof loads. If you’re in a wind area, like hurricane area, make sure that there’s – it will take the forces of the wind and then also there are areas that have expansive soil that can change and uplift your foundation. So depending on the situation and where you’re building and your building department requirements, this answer may be different. So there are different ways to verify that the structure is right. But we are fully capable of doing full engineer-stamped, structural engineering for any house in the country to go through and make sure that it meets or exceeds the requirements for the design criteria that are at its particular building site. What people have to really watch – let’s just take snowloads. That’s like the weight of snow or any weight on your roof. If you take a mountainous area, you can have some areas that have a thousand two or three-foot rise or drop within a couple of miles, within half a mile. So sometimes people go through and say, “Oh my neighbor, he had a 50-pound snow load.” Well, he’s at 5500 feet and your house half a mile away is at 6500 feet. But you might have an 80-pound snow load. So some of these areas are special areas where you’ve got to not just call the building department, but you’ve got to interpret by the elevation where it is and what the snow load can be. It could be extremely significant. We’ve got some 150, 175-pound snow loads. If they built on the other side of town, it would have been 120. Just to give you an idea, most areas in the US are 20, 30 pounds. Steve Landmark: That probably covers 70 or 80 percent of America. It’s more when you get into the Rockies, the Sierras, the – where you end up in 100 plus snow loads. A lot of Northern – like Northern Midwest, you might end up 60, 70. That’s all stuff that we can work into it because it affects the beams, the connections, the trusses, the walls, the foundation design. So it’s very important to make sure that the house is structurally adequate for the area that you choose to build. You can’t go take a standard plan and say, “Hey, I want to go build it in the deep desert where there’s essentially zero snow load because it doesn’t snow,” and I go take that same plan up to Vail, Colorado or Lake Tahoe and thing that it’s going to support. It isn’t. It’s a different structure. The house may look the same or extremely similar, but it’s different. Interviewer: So you have time for one more question? Steve Landmark: Yeah, let’s do it. Interviewer: OK. So someone writes in and they want to know if Landmark can work with their civil engineer for grading and drainage plans. Steve Landmark: Yes. That’s becoming more and more popular is you hear of different floods or you hear of different situations and people build in more unique areas. Building departments and also you – this isn’t just a game of hey, let’s do what the building department needs. There’s a certain sense. If you’re in an area where there are floods or different situations, you don’t want your house to be affected by it. So the drainage is very important. Generally what happens is we may have a design concept that we’ve put together and the customer could work with their civil engineer to develop this grading and drainage plan. So the concept being that you might be in a certain area where the house has to be oriented a certain way. Let’s just take a mountain area for some reason. There may really only be one area to legally put a driveway. There might only be one reasonable area to put a driveway to access the house and there might only be one reasonable area of where to place the house, so that it doesn’t end up in a – you know, with other concerns, landslides, whatever situations there are. So what they do, the civil engineer does, is work to come up with an economical method to make sure the driveway will work. The house can sit. Wells and septic can fit properly. Any other setbacks for building departments or design criteria are there, so that you’ve got an efficient home. That’s very important in more complicated building areas, so that you end up building a house that is sensible even in a big rain or the thaw of a big snow. We just did a – we’re working on a project in Colorado. We had to raise the house two feet just because the snowmelt creates such a rush, that we had to end up with a situation of diverting it around the house and it’s very important. Again, it’s easy to do it on paper. It’s easy to do it on the computer. It’s very hard to move a house once it’s built. So yes, we will work with your local civil engineer on any grading drainages, use whatever are there. Also that brings up geotechnical reports, structural engineers. That’s a question that I usually bring up to people is, “Do you have a geotechnical report?” because that tells us the strengths of the soil. That’s generally in areas where you need engineer-stamped plans where there’s more complicated situations around mountains, earthquake areas, things like that where the geotechnical reports are important to tell us the strength of the soils, so that we can make sure that the house is supported properly by the strength of the soil below it. Then sometimes we get into geology reports of what is down there. Are you over an earthquake area or what types of rocks are actually under there? What could happen in a landslide situation? So we’re completely capable of working with your local professionals on that, to make sure that the design is proper and make sure everything comes together properly. Interviewer: So give us the lowdown on how someone interested in finding out more about Landmark Home and Land Company and the panelized home-building process. How do people go about contacting you? Steve Landmark: Well, we’re readily available. You can check out our – a lot of people will kind of preview our website, which is www.LHLC.com. That’s basically the letters for Landmark Home Land Company. We’re actually called Landmark Home and Land Company, but www.LHLC.com is the website and you can call us at 800-830-9788. It’s always good to look at the website, get an understanding. But we’re always available to talk about what you need and what your project is and how well this comes together. This isn’t a cookie cutter situation of, hey, take a house. Put it on your land and hope it works. It’s a, “Let’s plan it out. Make sure it’s right,” so your home is energy-efficient, structurally-sound. The design you want, it works on the land and that altogether makes it an enjoyable home to own. Interviewer: And people going to the website, what can they expect to find there? Steve Landmark: Oh, we’ve got a lot of details there. We’ve got different plans. We’ve got different details on what owner builders do, the panelization process. We’ve got some animations that explain stuff and then we’ve got these podcasts. So there’s a lot of information there. So you might have to visit it once or twice to let it sink in and like I say, we’re always available. You can email us there. You could ask us specific questions, set up time to call and talk. You can give us a call, 800-830-9788 and you can contact us. So whatever is convenient for you, whatever method it takes for you to allow us to help you through the process. We’re there to help you and make it easy and enjoy the process. Interviewer: Well, great. Well, fortunately, we’re about out of time for this episode. This has been fun. Once again, a real treat to delve into what Landmark Home and Land Company does and to pick Steve’s brain a bit regarding the process of panelized home building. So for Steve and myself, you’ve been listening to the Panelized Prefab Kit Home Building show from Landmark Home and Land Company and we will see you next time.